Hey guys, Name's Dan. I'm new here, really Impressed with what I've seen so far so i thought I'd share what i've got too, since it's in the same vein. 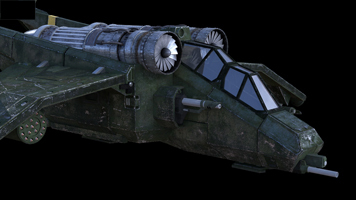 I chose the Valkyrie because It seems to be the most recognisable aircraft from the Warhammer Universe. Honestly, I know very little about WH and i don't claim too, I just take great inspiration from the fantastic designs. Also from one of your members, Binkerman. THIS THREAD in particular. Right now i wont go into any specifics about what I have In mind, I'd just like to get some thoughts on my modelling/texturing for now. I should note that the textures on this are about 80% complete, mainly the weapons that aren't done just yet. Darn nice job on this. Keep it up. Yep, rocks. Keep it up!